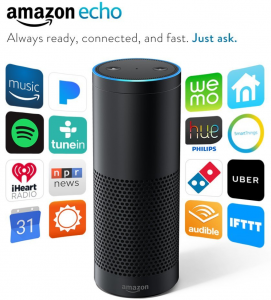 Amazon introduced the Echo speaker on in November 2014. At that time, it could only be bought by special invitation and Prime members at that time. Not much was known about what this ‘smart speaker’ could do. Today, ‘Alexa’ has found its way in to millions of homes. While Amazon Echo is amazing by itself as a smart assistant, it is even better as a voice-controller for smart home installations. Fast forward a couple of years and we now have two additional devices added to Amazon’s speaker lineup. It is now easier and more affordable than ever to bring one of Amazon’s smart speakers in to your living room. All three devices can be used to play music from Amazon Music, Spotify, Pandora, iHeartRadio and many others. They answer questions, read you the news, provide a weather report, finds information on events, local businesses and much more. In addition, they can be used as a controller for your smart devices like lights, switches, thermostats. Compatible devices and brands include Nest, Philips Hue, Samsung Smarthings, Wink, Insteon and EcoBee. Released first in Amazon’s speaker lineup, Amazon Echo, is priced the highest at $180. It is a high-quality Bluetooth speaker with an integrated, always-on microphone ready to find answers to your questions and respond to your commands. The wake word, “Alexa” will trigger the speaker and it is ready to interact with you and other smart devices in your connected home. The speaker is rich sounding and can easily fill a room with sound. Available in Black or White. 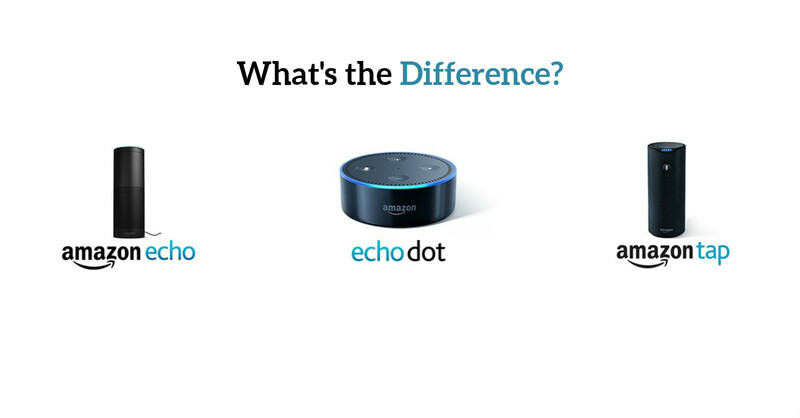 functions of the Echo, it comes with a 9-hour integrated battery. It required to be ‘tapped’ or touched to be activated when first released. However, with a recent over-the-air update, Amazon has added the option of leaving the microphone, always-on. This is a great feature while connected to a power source, but will drain the battery quickly when not charging. The speaker is loud enough for a small space, dorm room or kitchen. First released in April 2016 for $90, a new updated Amazon Dot v2 has just been released in September 2016 currently selling for $49.99. Available in black or white, it is a hands-free, voice-enabled speaker, albeit with a less powerful speaker matching quality of a smartphone speaker. It does have a line-out and allows you to plug in your own speaker or pair it up with a Bluetooth speaker. 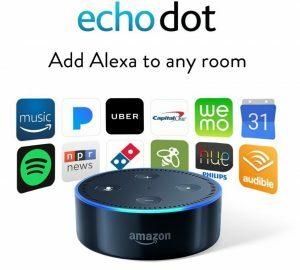 The Echo Dot packs all the functionality of an ‘Alexa’ powered smart assistant for less than $50. 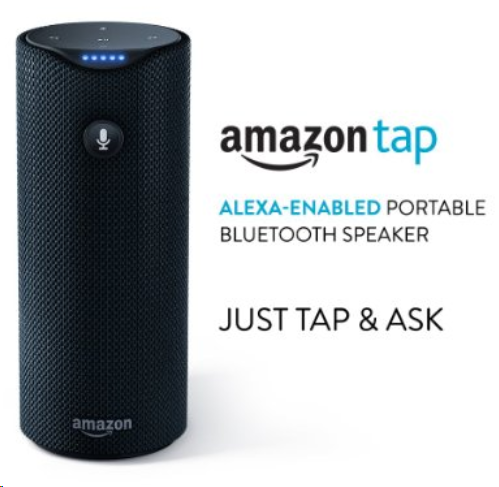 Amazon also offers a Voice Remote for the Amazon Echo and the Echo Dot at $30, allowing you to interact even beyond the standard listening range of the microphone. This remote does not work with the Tap and needs a button to be pushed each time.